We've been getting excited about Halloween and have been searching the internet for some of the best ideas online. Here are some of the tastiest recipes out there. Simply double (or even triple) the quantities if you have a large gang of trick-or-treaters to feed. Preheat the oven to gas 7, 220°C, fan 200°C. Put the passata and olive oil in a pan and bring to the boil. Reduce the heat and simmer for 5 minutes, or until thickened. Empty the pizza base mix into a bowl and stir in 100ml (3 1/2fl oz) warm water. Mix to a soft dough, then tip out onto a lightly floured surface and knead for 5 minutes, or until smooth. Roll out the dough to roughly 24cm (91/2in) in diameter. Transfer to a large, greased baking sheet and turn up the edge of the base for a crust. Leave to stand in a warm place for 10 minutes. Meanwhile, thinly slice 8 olive halves lenthways into 4 to make 32 legs for the spider (each spider has eight). Dice two more olive halves to make eyes for the mozzarella ghosts. 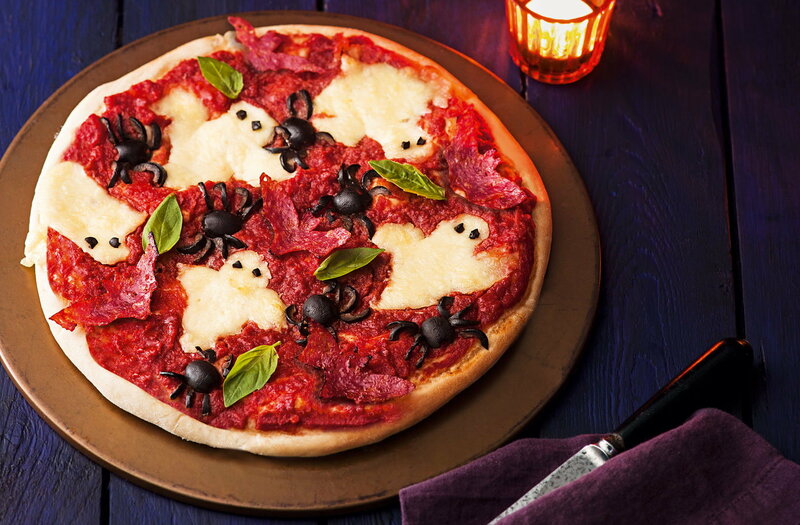 with the salami and arrange the torn mozzarella in ghost shapes (with room to spread). Position the remaining olives, cut-side down, and arrange 4 spidery legs on either side. 1 minute, before adding the reserved olive eyes to each melted mozzarella ghost. Serve immediately. Pour the vodka into a measuring jug and add the food colouring, a drop at a time, until you have a good black colour. Take 4 tall, narrow glasses and divide the orange juice between them. 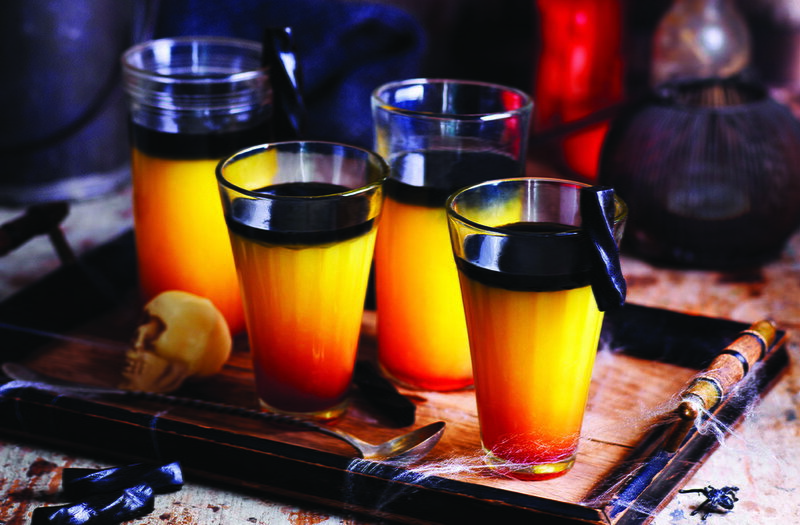 Add 1 tsp of grenadine to each glass, this creates a cool sunrise effect. Using the back of a spoon slowly and carefully pour the black vodka onto each of the drinks in turn, it will sit on the top in a neat layer. Serve immediately with a liquorice twist in each glass. These garish, grinning monster cupcakes may look inviting, but beware, at the centre of each cake is a gory, strawberry surprise. Preheat the oven to gas 3, 170°C, fan 150°C. Line a cupcake tin with 12 large, paper cupcake cases. Using a hand-held electric beater, beat the caster sugar and butter together in a mixing bowl for several minutes, until really light and fluffy. Whisk in the eggs, one at a time. Fold in the flour, milk and vanilla and divide the mixture between the paper cases. Bake for 13-14 minutes, until pale golden and slightly bouncy when pressed. Transfer to a wire rack and allow to cool. To make the frosting, slowly beat the butter and icing sugar together in a mixing bowl, then beat with a hand-held electric beater at high speed for 3-4 minutes, until very light and fluffy. Beat in the vanilla, food-colouring gel and milk to form a thick, airy icing, adding extra food colouring as needed to create a shade of garish green. Transfer to a piping bag fitted with a small, star nozzle. Using a small knife, cut a plug out of the top of each cupcake, removing half a teaspoon of the cake from the top. Drop in a small teaspoon of strawberry jam and replace the cake ‘lid’ on top. Repeat for each of the 12 cupcakes. Working slowly in circles, starting from the outside, carefully pipe tiny peaks of icing all over the surface of each cupcake. Repeat until each cake has a ‘hairy monster’ covering. Slice 3 of the liquorice sticks across into discs (8 per stick, making 24 discs in all). Now divide 25g (1oz) of the white icing into 24 small marble-sized balls, rolling them to shape. Sit a liquorice disc on each icing round and press down, bringing the white icing up at the edges to create a monster eye. Sit two on each cupcake. Slice the remaining liquorice sticks into fine lengths and use as angry eyebrows and mouths. 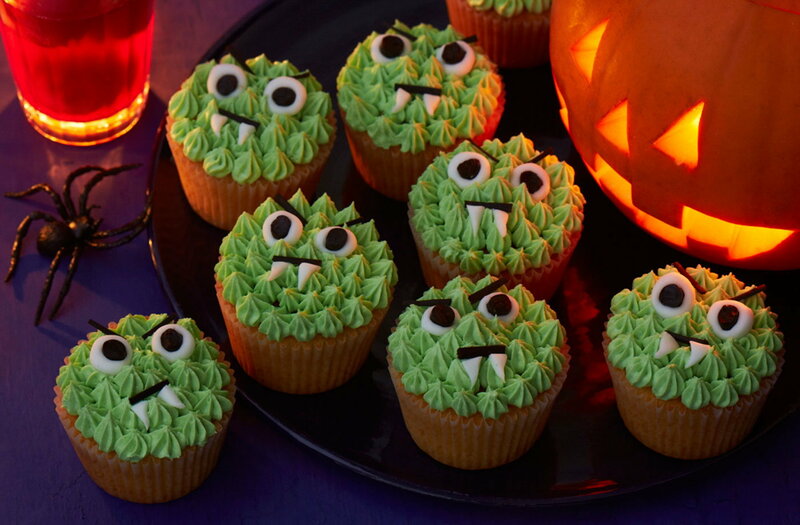 Shape the remaining 5g (1/4oz) white icing into little triangular ‘fangs’ and sit these on the mouths to make scary faces. » Johns Cross Open Weekend 2018!